cranial sutures – All Things AAFS! 10/09/2013 by All Things AAFS! This is the 4th blog post in this Quick Tips series on chronologically dating human skeletal remains, if you haven’t read the first post click here to start at the beginning. In my previous blog post I introduced the method of chronologically dating sub-adults using dentition, you can find out this information by clicking here. 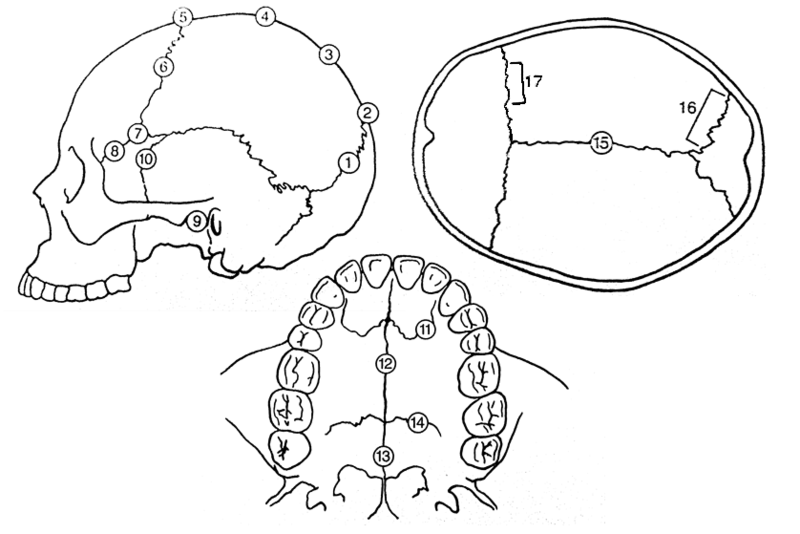 Figure 1) Diagram showing the seventeen cranial suture sites. 0 is given when the suture is open, meaning there is no evidence of ectocranial closure. 1 is given where there is a minimal closure of the suture. 2 is given to sutures with evidence of significant closure. 3 is given to a completely obliterated suture (complete fusion). So to attain the age of a skeletal remain you would total the scores for each grouping of sites, vault (1-7) or lateral anterior (6-10), and by comparing the scores to the known composite scores vs. chronological age of Meindl And Lovejoy, 1985 (Figure 2). Figure 2: Table demonstrating Meindl and Lovejoy (1985)’s composite scores of the sutures on the vault and lateral-anterior, respectively, in relation to mean chronological age. A very useful cranial suture site is the sphenooccipital synchrondrosis, because at least 95% of all individuals have fusion here between the ages of twenty and twenty-five, with most individuals experiencing complete fusion around the age of twenty-three (Krogman and Işcan, 1986). Buikstra, J.E., Ubelaker, D.H. 1994. Standards for Data Collection From Human Skeletal Remains.Fayetteville, Arkansas: Arkansas Archaeological Survey Report Number 44. Krogman, W.M., Işcan, M.Y. 1986. The Human Skeleton in Forensic Medicine (2nd Ed). Springfield, Illinois: C.C. Thomas. Meindl, R.S., Lovejoy, C.O. 1985. Ectocranial Suture Closure: A Revised Method For The Determination Of Skeletal Age At Death Based On The Lateral-Anterior Sutures. American Journal of Physical Anthropology. 68, 57-66. This is the forth of a Quick Tips series on ageing skeletal remains, the next in this series will focus on the use of the pubic symphyseal surface to chronologically age skeletal remains. To read more Quick Tips in the meantime, click here! To learn about basic fracture types and their characteristics/origins in their own Quick Tips series, click here!